Posh centre-back Ryan Tafazolli after the win at Blackpool. Photo: Joe Dent/theposh.com. Key Peterborough United centre-back Ryan Tafazolli is an injury doubt for the League One game at Fleetwood on Good Friday. 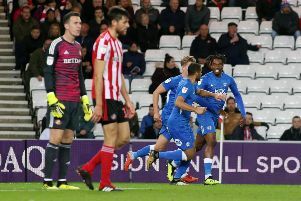 Tafazolli picked up a knee injury in the first-half of last weekend’s 1-0 win at Blackpool, but finished the game as Posh registered a third clean sheet on the blounce. Obviously his absence would be a huge blow as his partnership with Rhys Bennett at the heart of the Posh defence has looked rock solid in recent matches. Whether or not Tafazolli plays at Highbury is complicated by Posh also hosting automatic promotion chasers Sunderland on Easter Monday. Fellow centre-back ben White is also struggling with an ankle injury. If both are absent Posh would be left with Bennett and on-loan Leicester City player Josh Knight as fit centre-backs, although first-choice right-back Jason Naismith has played successfully in the middle of the defence this season. “Ryan and Ben are both doubtful,” Posh boss Darren Ferguson said. “Ryan has more chance of playing than Ben and he will be given every chance to make it. Ben’s injury hasn’t cleared up as quickly as we expected. Posh are travelling north early tomorrow (August 18) and will train at Manchester United’s plush training base at Carrington in the afternoon. Posh are five points behind Doncaster Rovers who occupy the final League One play-off spot, but have a game in hand. Doncaster have a tough game at Sunderland, a match that kicks off two hours after the Posh game at Fleetwood.